wendy house » Blog Archive » McAfee is a desktop BULLY! This scribble was published on Saturday, January 7th, 2012. You can follow any banter on this scribble with the RSS 2.0 feed. You can share your inspired musings after typing the anti spam word near the bottom of the page. But no Pinging because its too naughty. I used to deal with bullies on the bus. They never messed with me. 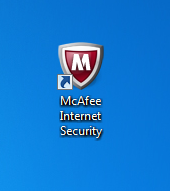 Do you want me to contact McAfee for you? I must come across as a sweet lady but I’m really a Georgia redneck at heart. Just let me know! Adobe Reader is another app cut from the same cloth. Every time it upgrades itself – which feels like every other day – it reinstates its desktop-polluting short cut. I mean, who opens a PDF by opening Adobe Reader first? You just double click the file you want. This behaviour has driven me into the arms of alternative PDF readers (specifically Foxit). Take that, Adobe. First you incurred the displeasure of the great, late St Steve Jobs, now mine. I bet you are trembling. There are many programs that go out of their way to be annoying. Many manufacturers of software, sometimes software that costs thousands, fail to understand that their number one goal is to make users more productive. Wendy, if I may make a recommendation, you may wish to check out Microsoft Security Essentials. It is far less annoying that McAfee or Symantec. On-topic: I’m not sure about Windows 7, but on my Windows XP Pro if I click on the desktop with my right mouse-button, the little menu that appears says “Arrange icons by >” at the top. The submenu that then appears has a setting that says “Show desktop icons” with a little checkmark in front of it, and I can turn that off. When it’s turned off, and I always have it turned off, it does not show a single icon on my desktop. Stefan, I’ve found the ‘hide’ desktop-icons control on Vista and Windows 7! It’s like a magic invisibility cloak for mess! Thanks for sharing!